Since 1992 Dime-A-Dip has been a staple event hosted by Brooklyn Recreation, on the first thursday in May, as a means of getting to know your neighbor, as well as enjoy a buffet style dinner were each “dip” is a dime. This is also the committee’s biggest fundrasier for the year. This event comes together in the form of donated dishes and wonderful volunteers who help us serve. We look forward to seeing you at our next one. NOTICE: You do not have to volunteer at the event in order to donate a dish. Also if you bring a dessert bar do NOT cut it up, we/volunteers will do that. 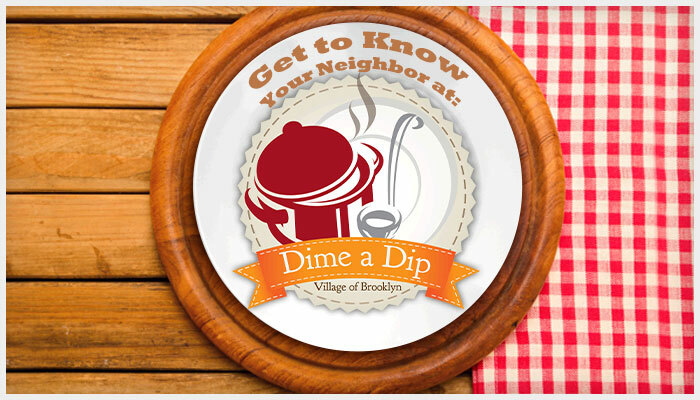 The Brooklyn Recreation Committee would like to give a big THANKS to all those who donated a dish and/or volunteered at the Dime A Dip Dinner on May 1st. We would also like to say thank you to all those who attended the dinner. We appreciate your support. This event raised around $500.00, which will go towards future Recreation Committee events and/or park equipment. If you would like to sign up, you can access the group meal by clicking here, or by visiting PerfectPotluck.com and locating the schedule by coordinator last name (Hardy) and password (4776).